We had a great Easter this year! 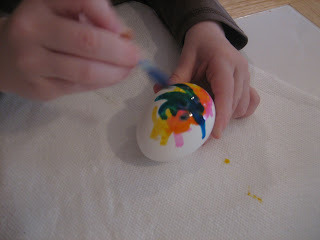 We began, of course, by decorating eggs. This year, I found these great q-tips that were filled with paint. You broke off one end, allowing the paint to fill the other end of the q-tip. 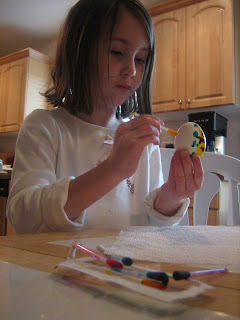 The girls then could "paint" their eggs. It was so much fun! 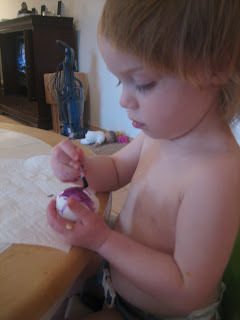 We also did the traditional dyeing of eggs as well! 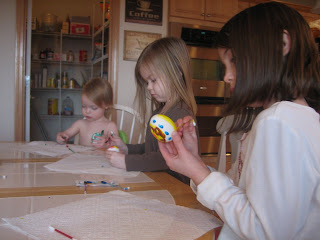 We even found some egg tattoos! 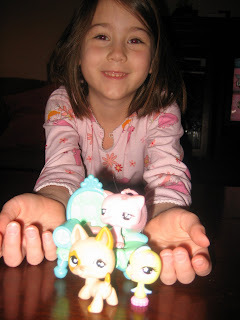 Rylie was so excited to show off the Littlest Pet Shop animals she got. 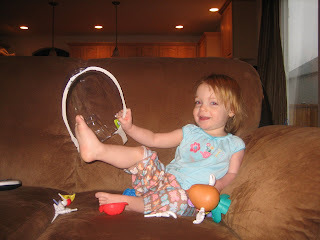 Taitlyn enjoying her Easter gifts. Everybody came over to our house for church later that morning since we are still without a facility to meet in. It was so much fun. 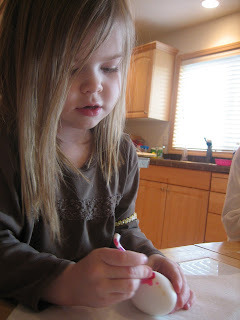 We worshipped together first, then had potluck lunch, followed by an egg hunt for the kids. We didn't get any pictures of the egg hunt on our camera because it was full. If we get some from other people though we'll be sure to post them! Apparently, there was something on our camera lens when we were trying to take a picture of all the kids! I can't imagine how that got there! Here is a picture of our girls once we cleaned the lens! 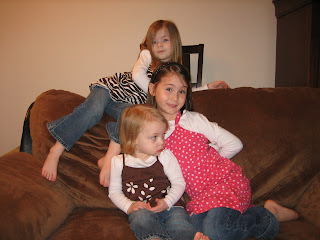 Unfortunately, Taitlyn wasn't looking at the camera in any of the pictures! So Cute!!! We had the Qtip things too--I personally loved decorating with them(probably as much as the kids) I'm glad your service went well. Hope you can rest some today after all that excitement!! 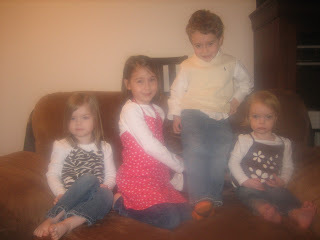 Cute pics of the kids! I saw Jen's pictures that she e-mailed - it looks like y'all (he he) had a good time. Sorry we missed it! P.S. Travis and I thought the service was very nice! We love you all ~ and miss you!